I have a love-hate relationship with my Cricut machine. I like the fact that I can cut any shape I want for any project I have, especially the ones in bigger quantities. During those times, I'm glad and thankful that I have the CE. But I have such a small craft room that I don't have space for my CE to just be laying there and available anytime I need it. And that's the reason why I don't use my CE as often as I should. And that's the part I hate. Anyway, this card has a cut piece from Cricut. 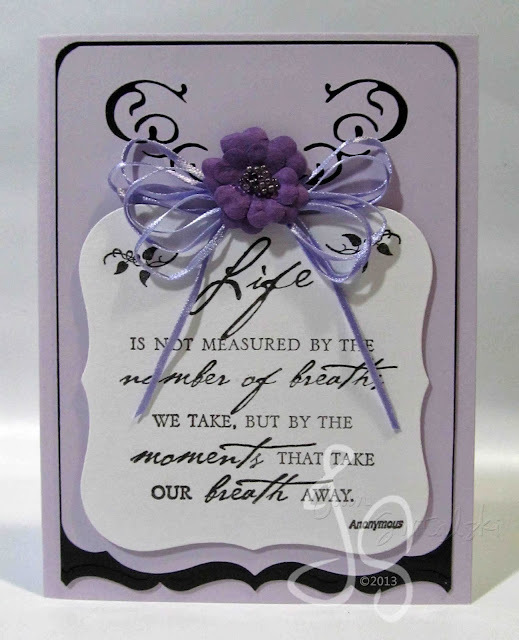 The edge punch and Spellbinders die I used went really well with the purple base. And guess what? My card has a bow too! Woot! Have a great weekend, crafty reader! 'Til next blog!